Kara stayed for dinner and resisted the temptation to pocket any more of the interesting trinkets that passed before her. She refrained from commenting that the food was too bland, and she didn’t stare at the scar-faced man’s scars or at the winged freak’s lack of wings. She even remembered to use the wooden tableware instead of her fingers. Being polite was much more difficult than she’d anticipated. After dinner it was quite late, and Kara was determined not to lose any more time, in case the lady realized just how much silver was in the bag of coins she’d handed over. She crept to the door unnoticed, and was about to slip out, when Jon saw her and dashed after her. “Are you going?” he asked. She considered pointing out to him what a stupid question that was, but he stood blinking up at her with his huge blue eyes as if she were someone he respected to a painful degree. The scar-faced Professor had followed him and was looking at her too. The Professor looked at her, surprised. “Oh. Um, it’s an inscription, from an old friend.” He opened the recovered watch and held it out. “What’s that supposed to mean?” Kara asked. “Just what it says,” the Professor said, softly. “Which are you, then, mortal or immortal?” Kara said mockingly. She left without looking back. She walked through the dark, swearing when the moon disappeared behind cloud, but able to see, regardless. As it got chillier she pulled her coat closer about her. She had only trudged a few miles toward town when the sound of a carriage caught up with her. 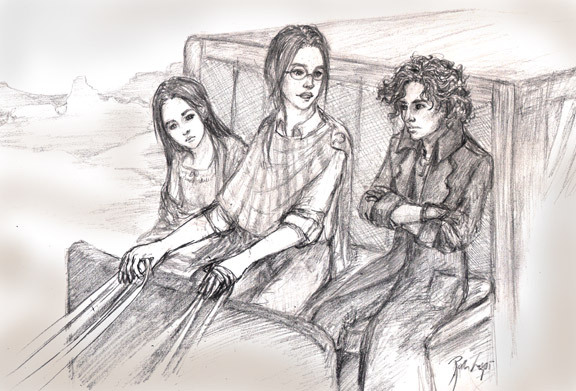 Kara considered arguing anyway, but was too tired to think of anything particularly stinging, and so with a single curse pulled herself up onto the carriage. She climbed to the top to find Djaren in the driver’s place and Ellea making room for her beside them. “You’re unkillable by whatever that thing was, you can see in the dark as well as Ellea and I, and can break locks by kicking them,” Djaren said. “There’s supposed to be a temple there that’s over three millennia old,” Ellea said. “Will there be another attack by supernatural horrors?” Kara asked sarcastically. “Good-bye.” Kara hopped off the carriage as it passed the first of the farms outside the village, and took to her heels, with Djaren’s silver spectacle case tucked carefully in her breast pocket. It had a star on it. Jon found the rest of the summer to be glorious if uneventful. Professor Sheridan had been nauseated, Hellin told them, seeing the mess in the passage, and even sicker at the sight of all the smashed artifacts in the burial chamber. Once he settled down to cataloguing and documenting, however, he was much happier. Djaren and Jon helped with translations and Anna with sketches and photographs, and work progressed quickly at the site. One day, not long before the end of Tam and Jon’s time in Alarna, it came time to open the clay sarcophagus and see how the Ancients and the Sharnish peoples had buried the warrior. 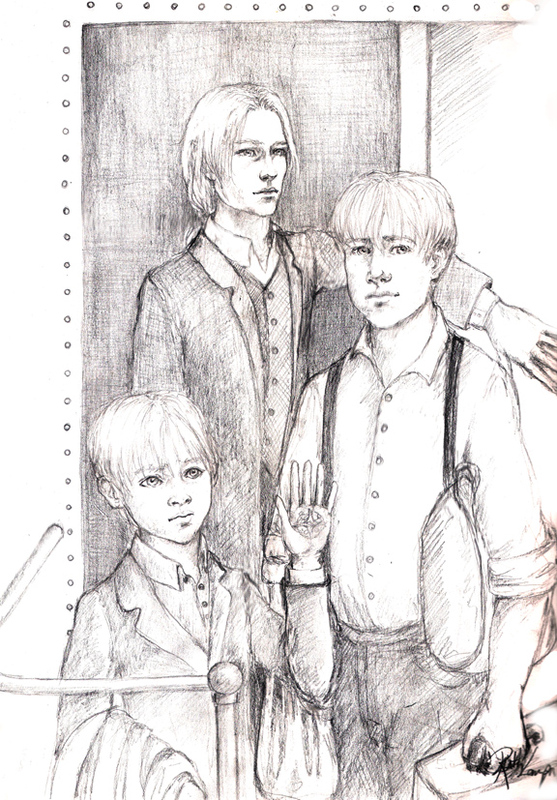 They stood gathered about the sarcophagus in hushed silence, as Harl and Doctor Blackfeather carefully lifted the lid. Anna held up a lantern to reveal the inside. Funeral wrappings lay bundled in an otherwise empty case. There was no sign at all of the warrior. The Professor spoke a blessing and touched the grave clothes. They crumbled under his light touch. “They did,” Jon said, lifting his hand. The Professor took the offered hand and stood, looking again at the silvery emblem. “And they passed it to you,” the Professor said, with a sad smile. “What kind of sign are you looking for?” Jon asked, watching the Professor’s blue eyes intently. The Times came the next day, as they sat waiting for the train that would take the Gardner brothers home. The children sat gathered round Anna as she finished the serialized story aloud. “Until she dies in three months,” Ellea said. “Maybe she doesn’t. Maybe now she’s done falling in and out of love with people and caring for her mad aunt and ailing father, she’ll steady out a bit and not feel the need to pitch over so often,” Tam said soothingly. “Are you saying Narmos isn’t safe?” Djaren asked, looking excited. “I thought history was mostly meant to be boring,” Tam said. “This might come in handy,” Ellea said, taking Jon’s hand in her own, and lifting it to see the sparkle of silver again.